The aim of this expedition led by Watkins was to investigate the possibility of an air route between Britain and Canada via the Arctic. The expedition consisted of 14 members who sailed on the Quest in July 1930. The expedition met and socialised with indigenous peoples in the area in which they studied. Courtauld spent five months alone undertaking meteorological measurements. Having left his spade outside he was snowed in and unable to leave his ice cap station; he had plenty of food supplies but only a little fuel so spent much of the time in the dark. This expedition formed a new method of surveying, combining land, coastal and aerial surveying techniques to give a fuller picture. The aim of this expedition led by H.G. Watkins was to investigate the possibility of an air route between Britain and Canada across the Arctic, if possible this would avoid a long and dangerous crossing over the sea. To establish this they took with them two De Havilland Moth aeroplanes to use for aerial surveying. The expedition consisted of 14 members and was funded mainly by private investors, but was under the patronage of the Royal Geographical Society. The expedition departed from London on July 6 1930 in the Quest (Shackleton’s old ship). The party reached Angmagsalik on July 24 1930, establishing a base 40 miles to the west on the mainland. This was near to an indigenous settlement, and relationships were struck up with their neighbours. Once the base was established a party of five left to set up the meteorological ice cap station at 8000ft. Riley and Lindsay remained at the station to undertake the first month’s observation, whilst the other three men returned to base on 3 September. On 2 October 1930 a trip was made to relieve the men at the meteorological station, this time Bingham and D’Aeth remained behind to continue the observations. Subsequent sledging trips were delayed by bad weather and so a revised programme needed to be established. One way they could recoup time was to make one sledging journey to the meteorological station, leaving enough supplies for one man for five months. Courtauld volunteered to remain alone at the station, the plan being to either relieve him by plane or sledge once the weather had improved. A survey was made of the east coast from the base camp at Angmagsalik to Cape Kangerdlugsuak Ford; the absence of sea ice that year allowed for very accurate mapping. The survey group were accompanied by one of the planes and whenever possible their survey was accompanied by aerial photography. On August 12 the Quest left Angmagsalik and went northwards along the fringes of the coast. They landed at Kangerdlugsuatsiak Fiord and explored it for the first time. The weather was too cloudy to take aerial photographs but it was possible to map the fjord from the ship. They moved northwards up the coast to Lake Fiord, this was an excellent base for the plane to work from and so the Quest remained for a few days whilst the motorboat went northwards to undertake a ground survey. The land party were left to map the area whilst the Quest went to find a suitable place for the plane to take off so an aerial survey could be undertaken. The Quest then returned to pick up the land survey party whilst the plane flew straight back to the camp. Plans for winter and spring work suffered due to abnormal weather conditions. The first undertaking was to relieve Courtauld who had remained alone at the meteorological station since the 5 December. The meteorological ice cap station consisted of a snow house built over a domed tent, entered by a long tunnel up through the floor, from this tunnel two side passages led into snow houses intended for stores. An 8ft wall was built around the house to shelter it; beyond here the meteorological instruments were kept. Attempts to communicate with Courtauld by plane during the winter had proved unsuccessful. A sledge party left on 3 March 1931 to go and relive Courtauld, unfortunately a blizzard made the search difficult and they were not able to find the flags which were meant to be marking their route, so they returned to the base camp. On April 21 another sledging party left, the weather was good and after 12 days travelling they were only two miles from the meteorological ice cap station. On May 5 1931 they reached the station, which had been buried in the snow, luckily the ventilation shaft still projected through the snow and Courtauld was well. Having left his spade outside Courtauld had struggled with the snow, it had filled both the exit and the openings into the snow house and stores. He had also been troubled by the loss of paraffin from two slightly punctured tins, this resulted in a shortage of fuel and as he also ran out of candles he had to spend some time in the dark. He also ate his meals uncooked so that the limited supply of fuel could be conserved to melt drinking water. The meteorological ice cap station was closed down and the men headed back to base camp arriving on 11 May 1931. The news that Courtauld was in the meteorological station alone and the others were having difficulty reaching him had caused a sensation in Britain. Watkins had left earlier instructions that a rescue would not be necessary but these were ignored and a high-powered aeroplane was sent. 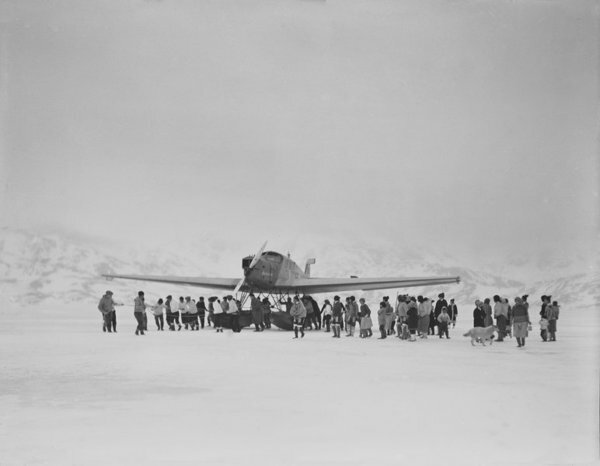 As this aircraft flew over the ice cap they saw the returning sledge party accompanied by Courtauld. Watkins congratulated the pilot for a successful flight but was of the opinion that the attempted rescue was never necessary and considered Courtauld’s situation very routine, as did Courtauld. However, the aircraft was useful in testing out a proposed air route to Canada. Aside from Courtauld’s rescue, three spring sledging journeys were planned. One of these was to continue the work begun in the autumn. A party of three travelled up the eastern edge of the ice cap to survey the inner side of the coastal mountains. Bad weather resulted in the journey taking much longer than expected and food began to run short forcing the party to return to base having covered only 90 miles. Of the 28 days in which they were away it had only been possible to travel on 13 days. A fresh attempt was made in May with the plan of climbing Mt Forel and to survey the surrounding country. The summit was found to consist of an ice-dome, which capped a wall of rock. The ice dome was much steeper than originally thought and so the plan to reach the summit was abandoned, however, they had reached the highest height in the Arctic. On 30 May they began the return journey and reached base camp in 12 days. The members of the expedition returned to Britain once their work on had been completed. The final members returned to Britain by September, having undertaken a large amount of surveying, combining land, coastal and aerial methods. Chapman, F.S. (1932) Northern Lights. The Official Account of the British Arctic Air-Route Expedition 1930-31. London: Chatto and Windus. Lindsay, M. (1946) Three Got Through, Memoirs of an Arctic Explorer. The Falcon Press Ltd. The Geographical Journal May, June, July and August 1932. The British Arctic Air Route Expedition 1930-31. This entry was posted on Wednesday, November 5th, 2008 at 4:42 pm	and is filed under Arctic, British Arctic Air Route 1930. You can follow any responses to this entry through the RSS 2.0 feed. Both comments and pings are currently closed.